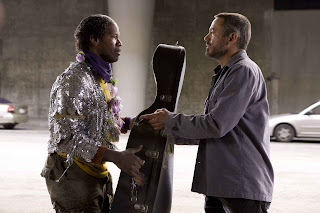 Fourth Row Center: Film Writings by Jason Bailey: On DVD: "The Soloist"
You’d be hard-pressed to come up with a major studio picture as badly handled by its distributors as Joe Wright’s The Soloist; one wonders if someone at Paramount had an axe to grind, or perhaps a bet to win. The film was originally slated for release in November of 2008—prime Oscar territory, the landing strip for intelligent, prestige projects such as this one. Then they inexplicably yanked it from the fall schedule and dumped it, unceremoniously, into the barren soil of late April. For both releases, the film was given an ad campaign that made it appear like yet another tale of a yuppie shaken from his comfort zone by a gifted but troubled genius (in fact, its particular construct—reporter meets once-great homeless guy—was in theaters a scant year earlier, under the title Resurrecting The Champ). So it wasn’t a surprise when it didn’t do any business—everyone assumed they’d already seen it. But The Soloist isn’t nearly that cut-and-dried; in fact, it’s a challenging, thoughtful, thrillingly well-acted story with more complexity and darkness than you might expect. It’s based on the true story of Steve Lopez (Robert Downey Jr.), a Los Angeles Times columnist who discovers a homeless musician named Nathaniel Ayers (Jamie Foxx) playing a two-stringed violin in the park. When Ayers mentions that he attended Julliard, Lopez is intrigued; he ends up writing a column about Ayers, whose schizophrenia led him to drop out of Julliard (and society). That article turns into a series of pieces about Los Angeles’ homeless population, and the two men begin a difficult, tentative friendship. The film’s first and perhaps most valuable asset is Robert Downey Jr., whose natural comic timing and inability to sound a false note help keep the story entertaining and grounded. He’s also well-served by the intelligent screenplay (by Susannah Grant, who did similar cliché-dodging duty on Erin Brockovich), which creates a believable newsroom of crass, overlapping witticisms—my only serious complaint, in fact, is that they bring in terrific character actors like Rachael Harris and Steven Root as his colleagues and then don’t use them enough. Director Wright (Atonement) is clearly a detail-oriented director, and the film’s authenticity is admirable; I wasn’t surprised to read that many of the people in the shelter sequences are, in fact, real homeless people. His shots sometimes call undue attention to themselves, but that’s a minor complaint, and his sure hand with his actors does the movie great favors—the always-reliable Catherine Keener does a nicely nuanced turn, and Nelsan Ellis (familiar as “Layfayette” on True Blood) plays some difficult notes easily in his small role. But this is, in many ways, a two-man show, and these fine actors are evenly matched. Downey has the less showy character, but he absolutely nails it; it’s a subtle piece of work, but the way it culminates in his sad confession that he’s “done trying” is close to astonishing. Foxx could have very well played his role as little more than a collection of tics, but he burrows deeper than that; given the scope of the character’s full history to play, he brings him to clear, tough life, and Wright inventively uses his entire filmmaking toolbox to put us inside Ayers’ head. Grant’s script sounds a couple of false notes—the tripled-up timing of Lopez walking into a banquet mere moments before he receives an award for his work on the Ayers story while simultaneously on the phone with a wigging-out Ayers is a wee bit too contrived, and making Keener both Lopez’s ex-wife and his editor feels like a stretch (and come to find out, it is; Lopez was happily married throughout the entirety of the Ayers story). But considering how broadly and melodramatically this story could have been written, the screenplay is a model of efficiency and tastefulness. And there are scenes of tremendous power—particularly a moment towards the end that is so moving, it hits you like a sucker punch. The funny thing about The Soloist is that although the broad strokes seem familiar, once you’re in the middle of this story, you’re not sure exactly where it’s going. There’s enormous complexity to it; Ayers isn’t rain man, and you can’t just trot him out to do his tricks and put him back in his box. More than most pictures of its kind, The Soloist deals in the messiness and loose ends of real life, and it’s in that emotional chaos that this film finds its greatness. "The Soloist" hits on DVD and Blu-ray on Tuesday, August 4th. i actually read the original articles in the la times, so i was really intrigued when i first heard about the movie. (especially the cast!) i then had the unfortunate experience to read some of the stories that the same la times wrote about the movie, including crappy review. that didnt deter my wanting to see the movie, but alas we didnt get a chance in the short run it played in our local theatre. but, i have been waiting to be able to rent it to see it.